The ancient Maya were the first known inhabitants, of Ambergris Caye, Belize and there are relics of many Classic and Post-Classic settlements there. The largest of these settlements is a Late-Classic to Post-Classic site known as Basil Jones or Bercellon (local translation of Basil Jones). Calling the site Bercellon differentiates it from the larger Basil Jones area of Ambergris Caye. South of Rocky Point and Robles Point, in the island's interior is the widest section of Ambergris Caye, the land is much higher and the deep black topsoil supports a much different vegetation pattern. Here is the Bercellon Maya Site, featuring a number of low mounds crudely made from local limestone and a network of stone walls. The area is dotted with well defined shell heaps and an abundance of obsidian flakings, fragments of pottery and an occasional jade ornament or object carved in bone. There is also a lot of fine charcoal, evidence of many of camp fires. Several burial mounds were excavated, in which bones were disturbed, the skeletons lying on their backs... and food offerings in pottery receptacles provided for their journey into the next world, indicating the usual method of burial among these people. A second mound was excavated, which had been built over the ruins of a small stone chamber. Nothing was found within it, but beneath the center was discovered a round saucer for burning incense, with a long handle, and a curious figurine in clay, whose face was covered by a peculiar grilled arrangement, more resembling a baseball mask than anything else, which was studded with rosettes. From their design and descriptions, these artifacts, have been generally accepted as Post-Classic. Because of this Bercellon has often been thought to be Post-Classic in origin. On the island, until the coastal areas were abandoned, the Maya supported themselves from the sea and engaged in regular trade with other settlements inland and along the coast. One theory is, in the Post-Classic period as a result of the dominance of the Putin, the Maya moved into the interior and built Bercellon. This is thought because of the importance of Bercellon's network of Post-Classic stone walls. 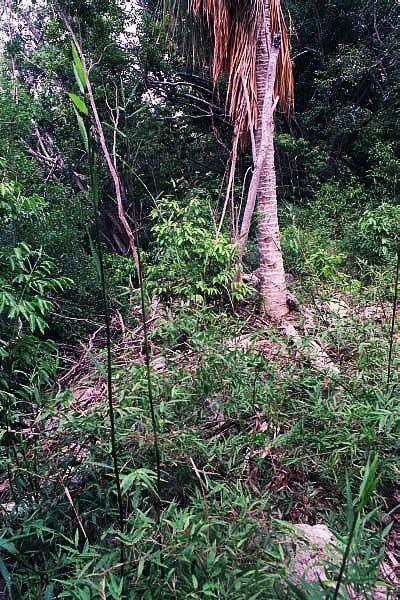 These walls surrounding the fertile Maya fields, contain soil, unlike the rest of the island and represent a major shift in the island's economy, to farming and an agricultural base as well as a definite move away from trading and fishing. 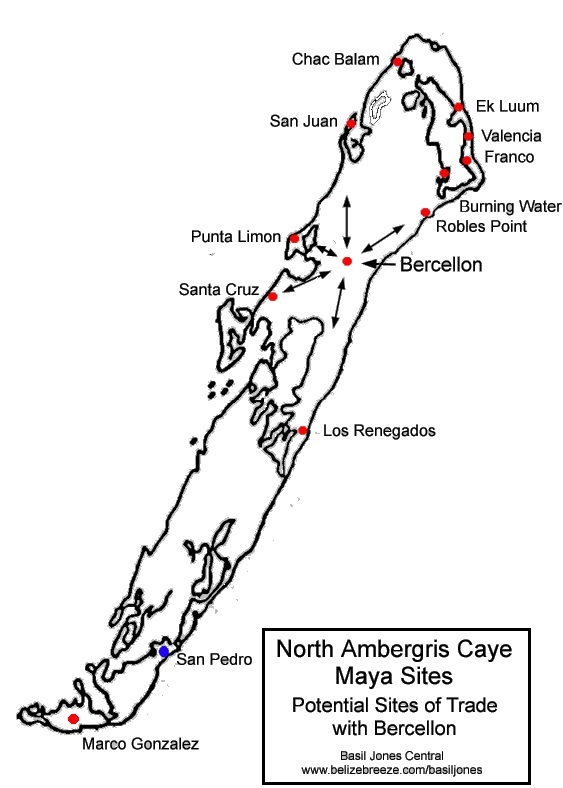 Maya sites on Ambergris Caye with possible trade routes. Another possibility is that Bercellon originated in the Late-Classic era. The ideal farmland at Bercellon was noted by hunters or overland traders when the Maya and trading were at their peak, during the Late-Classic period. The central location was ideal for growing and distributing agricultural products to the thriving coastal sites, thus making Bercellon an important hub for trade. Then over time as the coastal areas came under the influence of the Putin, from the Tabasco coast, the coastal sites such as Chac Balam and San Juan turned more and more to Bercellon to make up for the their diminishing access to the bounties of the sea, eventually abandoning the coast for Bercellon, but over a gradual period. It had been thought that the Maya had abandoned Ambergris Caye long before Europeans arrived. However, a map recently located in the Spanish archives at Seville appears to indicate there was a settlement on northern Ambergris Caye in the general area of Basil Jones. Other similar notations on the same map are of colonial missions. Of course, where there are missions, there must be Maya for the friars to convert. So it is probable the last Maya on Ambergris Caye were in the Basil Jones area. This is reinforced by the mention of migrant Maya living at Basil Jones well into the Blake Dynasty Era.